Beginner 1 classes are full! Email us to be added to the waiting list. WAG memberships run for the calendar year, so to get the most benefit out of yours, remember to join or renew early in the year. It's $60 for the year ($90 for a family membership), and the benefits include a reduced rate for classes ($90 instead of $120), and use of the club's field and equipment during the warm weather months when we are outside. View a map of our locations on our Contact Us page. Our students learn for a variety of reasons — to have fun with their dogs, to spend quality time together, and to train for agility competitions. We work with the Greg Derrett handling system to develop confident and consistent teaching and learning. 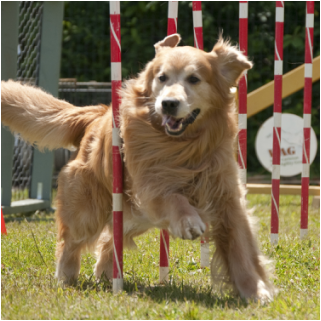 There are seven levels of classes that offer quality agility training in a relaxed and friendly environment. 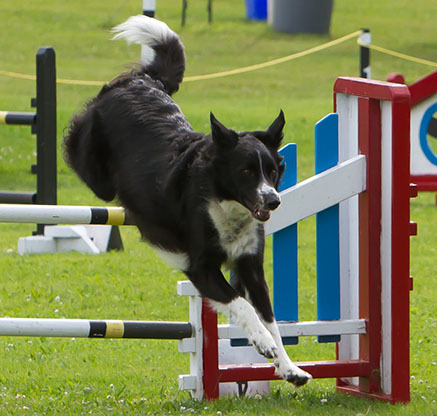 Basic introduction to all agility equipment. Suitable for puppies or dogs with no agility experience. Introduces basic handling and reinforces equipment performance. Dogs will not advance past this level until they have matured physically. Reinforces basic handling and introduces more advanced handling skills. Reinforces more advanced handling skills and introduces AAC games and competition courses. Develops equipment proficiency. Develops proficiency in more advanced handling skills, distance work, and AAC games and competition courses. Advanced handling skills, course analysis, distance work and directionals. Detailed course analysis with emphasis on consistent, precise, and nuanced handling.